Today my daughter Kelly turned 45 years old. I keep kidding her that if she’s not careful she’ll catch up to me. It seems like just yesterday she was a baby. Seems that the older we get the faster the time goes by. I wish Kelly the happiest of birthdays. Today my youngest granddaughter turned 11 months. She’s getting so big and is just such a delight. Of course I feel that way about all of my grand kids. She and her mama have started going to mommy and me classes and she just loves being around the other little ones. I never made it to my quilt guild today. I didn’t sleep at all last night and still feel like I have been hit by a truck. Have I mentioned I hate winter? That’s how I wound up down here in the south, too cold for me in PA anymore. I’m soooo glad winter weather doesn’t last too long down here. I made a quick chicken dish for supper tonight. 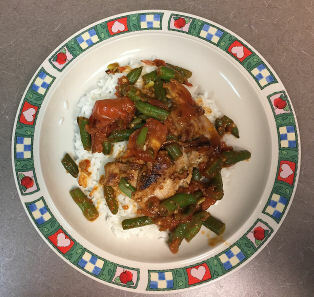 I took some chicken, garlic, onions, tomatoes, green beans, salt, pepper, and sauteed it all in a little olive oil. Then right before I dished it out I added just a little bit of tomato sauce. I served it on rice. It only took me about forty minutes and it was pretty tasty. I think I’ll make this one again. When Gary was alive, he didn’t let me cook. He took it over when I went to work at the hospital on the evening shift years ago. As much as it is nice to be spoiled, I did miss experimenting in the kitchen from time to time. So I am enjoying crating in the kitchen again. Have a good night and stay warm.